Why, they're right here, of course! 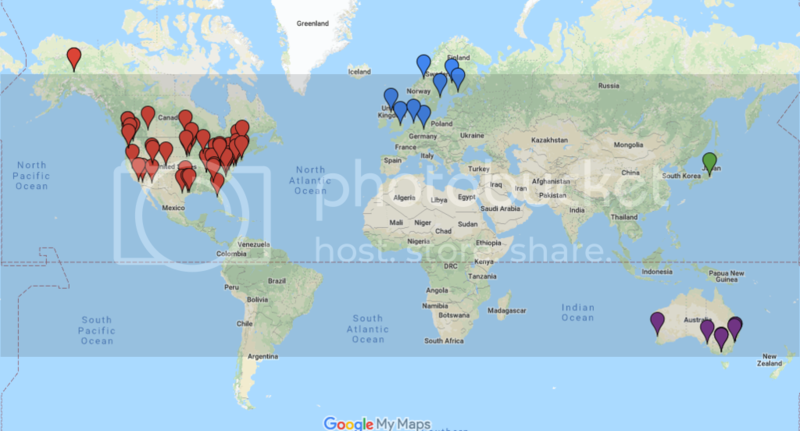 To be added to the map, just post your general location. People will be removed from this list and map after they have been inactive on the forums for 2 years. I reserve the right to change this amount of time at any point, with or without warning, based on the size of the list and contemporary additions. But for now, 2 years seems like a solid amount of time. Also be aware that these will happen on "purge dates" which means basically every couple months or so (I prospect) when I feel like going down the entire list and calculating the numbers (which takes a long time; hence every couple months). You should probably remove people who are not active members of the forum. Link's been updated. Visual map will come shortly after. I smiled seeing this, nice job JDMEK5! Now we just need a list of who resides where on the map. Isn't there a way to embed the full-zoom map with the list in the first post? My BBC code abilities are weak as of yet. Is it a bad sign if half of that flew right over my head? You mean put actual labels on the picture, right? That was the original purpose of the link (I found the old picture really messy with all those labels). But if you think that's what should be done, I'm sure I can figure it out. Also: Picture now matches detailed map. Wow... This is really fancy...is there a way to list more than one member at a single location? I feel bad that only I'm listed at North Pole, when shadow's been on longer than I have. I live in Vancouver, B.C. Yeah, I don't live in Lithuania. EDIT: I told SFK once I got my citizenship, I can be moved there. Fact is, I haz no Lithuanian citizenships yet. JDMEK found my secret hideout! Eek! That pic reminds me of junior high school recesses. There were some big groups of people always hanging around with each other (Europe/Usa&Canada) then there were some smaller groups of people (Australia) and then there was that guy who never hung out with anyone (Kman). Helsinki is the European New York. and then there was that guy who never hung out with anyone (Kman).